Racing starts for the 2011 Audi TP52 World Championships from the Yacht Club Costa Smeralda on Tuesday October 4th and finishes on Saturday 8th October. A full diet of windward-leeward races is planned with the coastal race scheduled on Thursday October 6th. Quantum Racing make one significant crew change losing navigator Kevin Hall to previously scheduled (USA) personal commitments. In his place will be young Italian navigator Francesco Mongelli who served for three years as navigator on Synergy. Among Quantum Racing’s toughest rivals will be the home team on Audi Azzurra Sailing Team (ITA), Alberto Roemmers’ crew which flies the burgee of the event hosts, the Yacht Club Costa Smeralda. 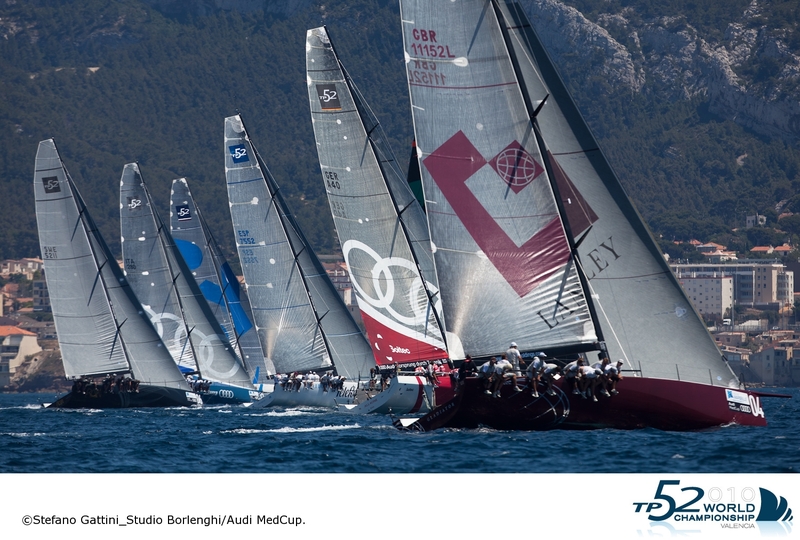 Ironically Audi Azzurra Sailing Team, which is skippered by Guillermo Parada (ARG) is one of the two teams that will race on these Sardinian waters which has not won an Audi MedCup Circuit regatta this season. But as Matador, the core crew won the 2009 world title in Palma, Mallorca and finished close runners up in 2010. The team’s line up is adjusted slightly from that which finished third overall on the Audi MedCup Circuit. Due to a match race commitment in Bermuda, Francesco Bruni will not sail on Audi Azzurra Sailing Team. Instead Vasco Vascotto (ITA) flies ‘solo’ as tactician. Britain’s Gladiator, owned and steered by Tony Langley (GBR) return to challenge for the world title again having added a number of sails to their inventory and expect to race with American Chris Larson as tactician. Larson will be bidding for a second world title in three weeks after recently winning the Melges 32 Worlds in Palma Mallorca. Spain will be represented by ESP 7552 which will be skippered and steered by Gonzalo Araujo and project managed by Ignacio Triay (ESP) sailing under the colours of a sponsorship which will be unveiled at the start of the championship.